ON THE evening of Feb 4, the air in Trinity Theological College (TTC) was charged: there was another special induction service. 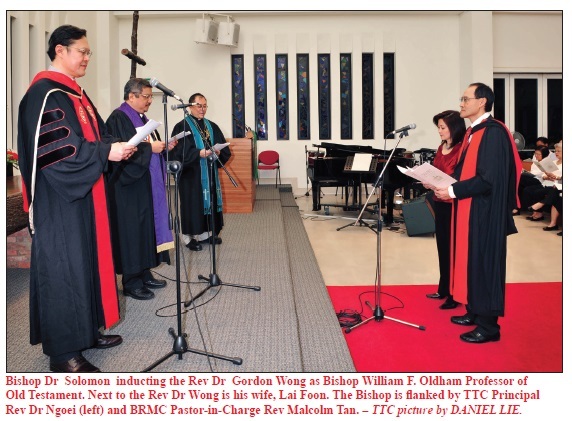 The Rev Dr Gordon Wong of Trinity Annual Conference (TRAC), seconded to lecture at TTC, had been appointed the first Bishop William F. Oldham Professor of Old Testament. He was inducted by Bishop Dr Robert Solomon, Chairman of the Board of Governors of TTC. The Irishman William Fitzjames Oldham (1854-1937) was part of the original missionary team from India that established Methodism in Singapore in 1885. He was the first Methodist pastor appointed to Singapore, and designed the first Methodist Episcopal Church (later Wesley Methodist Church). He also founded Anglo Chinese School in 1886 and is immortalised in the ACS school song as a “dauntless hero”. Although William Oldham left Singapore in 1889, he eventually returned as Bishop of the Methodist Church in 1904. 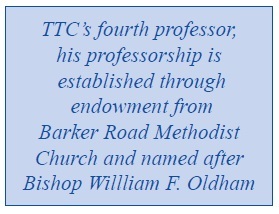 The endowment of the William F. Oldham Professorial Chair of Old Testament by Barker Road Methodist Church (BRMC) marks the fourth Professorial Chair endowed at TTC. In his opening remarks the TTC Principal, the Rev Dr Ngoei Foong Nghian, expressed appreciation to key leaders of BRMC: the Rev Malcolm Tan (Pastor-in-Charge), Mr Ben Tan (Local Church Executive Committee Chairman), Mr Mun Kwok On (LCEC Vice-Chairman) and Mrs Irene Tan (Lay Leader). He acknowledged their role in convincing BRMC to step up the church’s already exemplary commitment to theological education and the training of pastors at TTC. 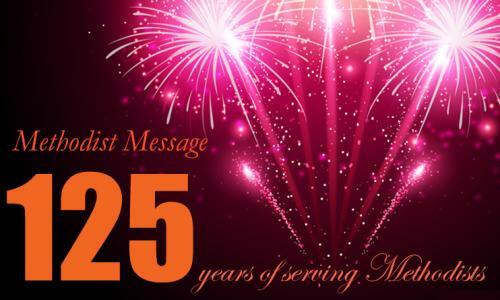 On May 18, 2008, on the 52nd Anniversary of BRMC, an announcement was made at all worship services that BRMC had given a $1-million endowment to endow a Chair. A competent scholar and much sought-after speaker, the Rev Dr Gordon Wong is a felicitous occupier of the Chair. He graduated from the London Bible College (now known as the London School of Theology) and has pastored several TRAC churches. He completed his PhD at the University of Cambridge in 1994 on “The Nature of Faith in Isaiah of Jerusalem” and has since taught Old Testament, Biblical Hebrew and Homiletics at TTC. His former supervisor at Cambridge in 1991, Professor Hugh Godfrey Maturin Williamson FBA, now the Regius Professor of Hebrew at the University of Oxford, flew to Singapore for the first time to pay tribute to his former student. He remarked to laughter that the Rev Dr Wong was the only doctoral student he has had who actually completed his degree in the subject he began with. Prof Williamson said scholars had to learn two lessons. First was the need to learn the proper way to study and analyse the Biblical text. Secondly, the skill to translate that academic expertise into a medium accessible for the whole church. He praised the establishment of the Bishop William F. Oldham Chair as sending out the right message that TTC continues to raise its academic standards, and that the Christian community here recognised the Rev Dr Wong’s scholarship. In the Rev Dr Wong’s inaugural lecture that followed, he addressed the question, “Why Profess the Old Testament?” In a scintillating and riveting lecture that employed visual aids and drama, he offered positive and cogent reasons why the Church must pursue the study of the Old Testament. He reminded the audience that God’s preachers were creative craftsmen, using effective aids and dramatic performances in their delivery. He urged the Church not just to see what the Old Testament says about Jesus, but to discover its message for us and what God wants to do in us and through us. Drawing many examples from the Old Testament, he proceeded to rekindle the interest in the Old Testament of many in the audience. For example, in Psalm 48:1-2, he showed the phrase “the city of the north (zaphon)” was actually a reference to a Syrian mountain reputed to be the home of Cannanite gods. 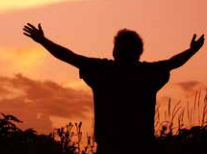 The psalmist is really saying that Jerusalem is zaphon par excellence, the city of the truly great King and God. The Biblical writer adapts a mythological idea to give praise to God, and contrasts zaphon as foreboding and inaccessible to Zion, humble and easily accessible to all. 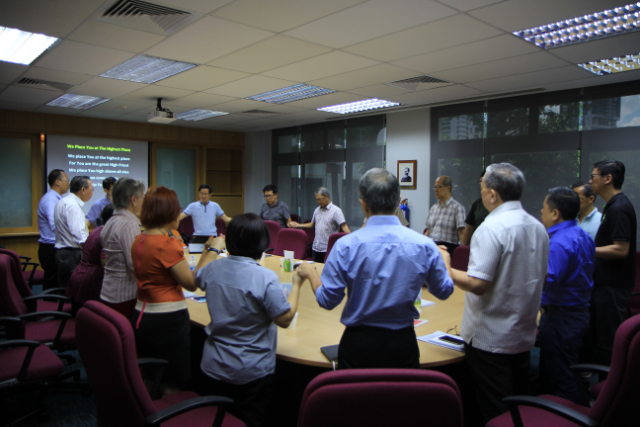 The Rev Dr Wong urged serious study and careful reflection of the Old Testament to eliminate wrong readings. He noted that Bishop Oldham was committed to education for everybody. He brought the Good News to all nations. In this, Bishop Oldham echoes the holistic emphasis of the Old Testament, an emphasis all Methodists should cling to. The induction service was blessed by the presence of the Rev Dr Wong’s wife of 20 years, Lai Foon, as the organist. Their son Jeremy also participated in a dramatic “smashing of a pot” during the lecture. The evening also saw the launch of the Rev Dr Wong’s latest book, The Road to Peace: Pastoral Reflections on Isaiah 1-12, dedicated to the members and leaders of BRMC. in the Multi-Purpose Hall of TTC. Expectations had been raised following his earlier Sunday sermon at BRMC, and he surpassed all expectations with ease. One of a select group of individuals with the title FBA (Fellow of the British Academy), Prof Williamson’s lecture evinced his paramount standing not only as a Biblical scholar but as a Spirit-filled evangelical. For over an hour, he showed his spell-bound audience how Isaiah, even in passages traditionally taken to refer to Jesus, still has much relevance today for the modern Christian. 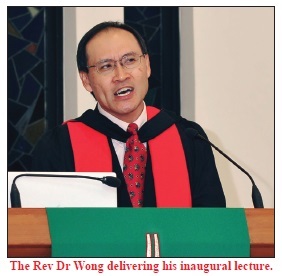 After the lecture, one impressed TTC lecturer was heard to mumble, “Makes me wonder why I ever left Biblical Studies … ” Certainly, the Rev Dr Wong’s and Prof Williamson’s lectures will spur others to a deeper intimacy with the Word of God. 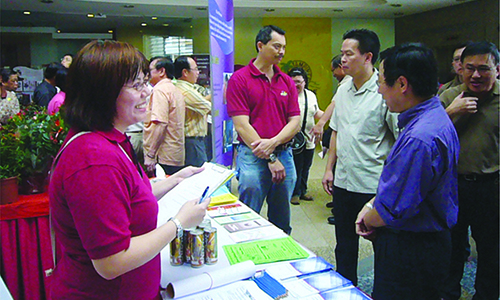 The Rev Chiang Ming Shun, Pastor-in-Charge of Aldersgate Methodist Church, is a member of the Methodist Message Editorial Board.